At the end of 1992, immediately after New Year's Day, Sviatoslav Richter was in Rome, coming from Moscow, just after the end of the festival "the evenings of December", founded in 1981 by him and by the manager of the prestigious Puskin Museum, Mrs. Irina Antonova. The festival concerts took place in the Museum rooms, between a selection of paintings and drawings chosen according to a musical and pictorial "theme" . The happy Muscovite audience could in this way appreciate Richter in various ways: as soloist, with chamber groups, as singers accompanist, and even as director. During the 1992 festival, dedicated to "Rembrandt and Beethoven," Richter performed the Beethoven "Archduke trio" with his friends of the Borodin Quartet, the first violin Michail Kopelman and the cellist Valentin Berlinskij. He also played the Op 16 "wind quintet" in collaboration with a French young group, that the Master remembers with much pleasure and enthusiasm. Soon after, on the eighth of January 1993, we listened to him in S.Cecilia-Rome, in the following performance: Beethoven - Sonata Op. 31 n 3, Chopin - Polonaise-Fantaisie Op. 61 and Skrjabin- Second Sonata, two Mazurkas Op. 40, Nocturne Op. 61, concluding with "Vers the flamme" Op 72. Then The Master expressed the desire to offer a free concert in a Conservatoire situated along his journey South. The lucky school was in Benevento, where our friend Paolo Ponziano Ciardi is a teacher. He immediately started organizing the historical happening in collaboration with our Association. On the 11th of January, under the aegis of the Municipality of Benevento, of the Symphonic Institution of Benevento and Sannio, and of The National Conservatoire of Music of Benevento, Richter performed at the "Theater De Simone" for an audience of students and academics. Yamaha brougth the piano to Benevento, with quality assistance. The program, directly hand written by the Master, showed his curriculum and his usual quotations: "Why don't I play without score"? "Why do I play with faint light"?. Here is the program: Bach, sonata in D minor BWV 964; Beethoven sonata in F major op. 54. After the interval: Chopin, Polonaise in D minor posthumous opera and three studies posthumous opera; Skrjabin, sonata-fantasia N.2 in G sharp minor op. 19 and, to finish, Debussy, the "Isle joyeuse". A quotation from his curriculum, dictated personally by the Master, states: "In 1937 he moves to Moscow and then enrolls at the Conservatoire, at the class of the famous pianist Heinrich Neuhaus, of which he says ' he was my second musical father.'" 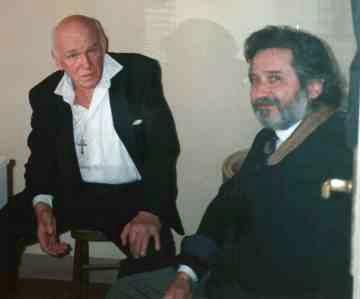 At 4:30 PM Sviatoslav Richter (above with Valerij Voskobojnikov in Siena, 1992) went to the theater. The audience, composed by many young students, was asked not to bother the performer taking photos during the performance and not to record. At the beginning they were perhaps a little frightened, but soon the audience warmed up becoming enthusiastic with the encore: "Bruy�res" by Debussy. The Master confided us that the program had risen in a fairly casual way. But we know him, and we can disagree. The program was a collection of great composers works, too often neglected by the Italian Conservatories, in which he chose in a near to automatic way for an audience of young students. At the end of the concert the Master in his dressing room autographed many of the programs for the young audience. Happy, incredulous expressions, for the unforgettable opportunity in the small southern city. After the concert Paolo Ciardi and I were entertained by the Master, who was with his agent Mrs. Milena Borromeo, at his hotel room. We entertained a pleasant conversation wich started with our thanks and apologies for the inevitable discomfort, faced by the Master with serenity and generosity. The Master asked us news about our Association, and gave us his approval in the remembrance of our great Teacher and Master. He also gave us the friendly and witty declaration (farther) , always remembering with great love the genius and the charm of H. Neuhaus.